The official order came through in July this year but delivery and installation of the fans has now begun and will continue until March 2015. According to Gavin Ratner, Director and Spokesperson for MechCaL the mines that will now benefit from MechCaL’s technology include Dishaba, Tumela, Bathopele, Khuseleka, Thembelani, Siphumelele and Twickenham. MechCaL will be supplying close to 316 fans ranging from 22kW 762mm fans to the standard 762mm 45kW fans as well as a few of their 75kW 1016mm units for underground use. 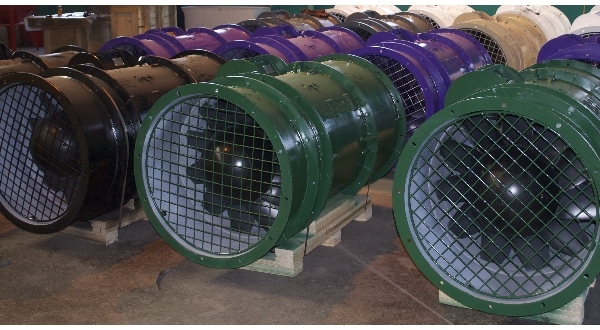 MechCaL has become well known for their innovative designs and unique use of technology to manufacture fans for the mining industry. Their patented design is coupled with the use of light weight materials to create fans that boast increased efficiency, operational and energy savings, and lower mean time between failures. Ratner explains that the type of existing fans being used underground at these mines are cambered plate fans designs that that are traditionally very inefficient. “At best they perform at 60% efficiency and have in most cases been refurbished numerous times resulting in a degradation of performance,” he states. It was this unique technology that caught Anglo Platinum’s attention says Gerhard van den Berg, Group Energy Engineer for Anglo Platinum. “We replaced 36 fans at our Union Mine with MechcaL fans as part of an Eskom Demand Side Management project. The success of the project prompted the company-wide roll-out of MechCaL fans,” says van den Berg. MechCaL’s designs have been proven to provide 80% or better efficiency in performance and deliver higher flow rates. This results in significant savings in power drawn from the electrical grid. Added to this MechCaL has developed advanced VSD systems, which incorporate intelligent control that will enable ventilation on demand for the secondary fans. These systems will actively control delivery to ensure optimal system savings through reducing – or at times increasing – fan delivery to ensure that the mines are properly ventilated at all times. According to Ratner, this will not only ensure that the correct flows, temperatures and gas concentrations are adhered to, but will optimise the efficiency of the entire system. Ratner explains that when this change in duct sizes is coupled with an intelligent controller developed by MechCaL, significant savings are achieved. When working in underground space constraints are the limitation to the duct size, however in most mechanised mines, the haulage sizes can accommodate the duct increase in areas required says Ratner. MechCaL has been awarded the prestigious Technology Top 100 award five times and has been a runner up three times. We have also won the Enabling Award from Frost and Sullivan. All of this success was garnered from reinforcing the advances in technology to enable the savings. Like them on Facebook at Mechcal.